We only use the best available technology for our Germany unmetered servers to ensure that we provide high-quality unmetered bandwidth to our customers. With PraHost Germany Unmetered Servers, you can avail unmetered bandwidth, as much as you want without the tension of overuse charges. This is best for budding enterprises, which do not need any fixed bandwidth every month. Our germany network strcture includes more than 60 Gbit of redundant network connections via De-Cix, Global Crossing, Tiscali, AM-SIX and other carriers which offer guarantee the perfect mix for maximum performance. When you hire our services, you will not only get the reliability of industry leading hardware and state-of-the-art infrastructure along with N+2 Redundancy, but you will also get the care of our altruistic support. When it comes to quality, PraHost settles for nothing but the best. This is the reason that all our datacenters are equipped with hosting mechanisms and routers from leading names in the Industry like Cisco, Dell, HP and Intel. 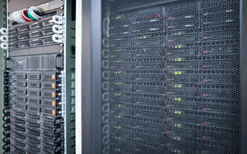 Why Select Germany Dedicated Servers Hosting? Our connection with the leading telecom carriers across Europe acts as a catalyst for your business. 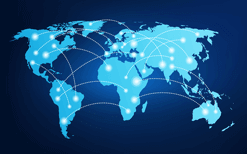 You can easily connect with any telecom carrier as they have scattered data centers all over Europe and United States. Our Germany Server offers pro-level flexibility and multifaceted security. Our dedicated servers can be used by experienced professionals with root access and by total rookies in this field with the help of our selfless support.